72 delegates, representing 27 different monasteries and nunneries, schools and communities from across the Himalayan region, gathered at Tergar Monastery for the 8th annual Khoryug conference. 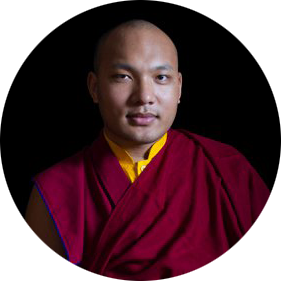 Khoryug was founded in 2009 by the 17th Karmapa Ogyen Trinley Dorje as an environmental association of Tibetan Buddhist monasteries and nunneries all working towards environmental protection, sustainability and climate change resilience. Khoryug is an initiative of Kun Kyong Charitable Trust and Khoryug Advisor, Dekila Chungyalpa and Khoryug’s Program Officer, Lhakpa Tsering, initiated the day with a warm greeting to all participants. This year’s conference focused on disaster management and waste management. Sessions over the course of the three days featured training on these topics as well as presentations and demonstrations from Khoryug monastics on their achievements and focus group discussions on identifying Khoryug’s next steps. 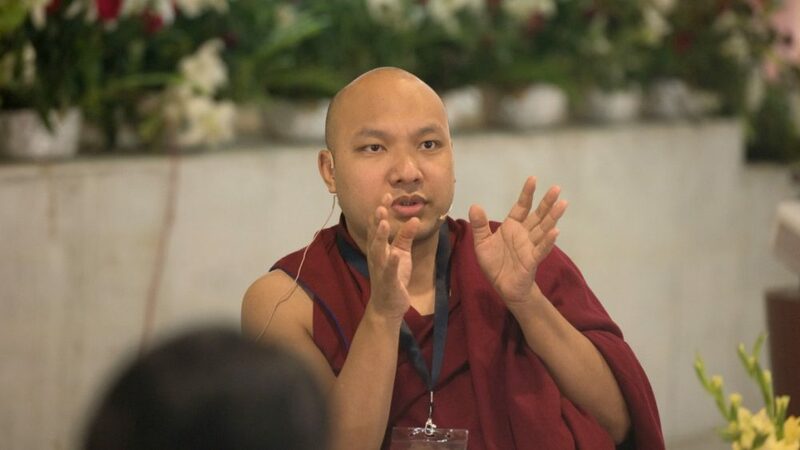 His Holiness the 17th Karmapa commenced the conference by revealing Khoryug’s new logo. The new design depicts Mount Kailash in the center with rivers flowing down to Lake Mansarova. His Holiness explained that he created this design based on the significance of Mount Kailash in both Hindu and Buddhist cosmologies. Referred to as Mount Meru in ancient Indian and Tibetan texts, Mount Kailash features prominently in both Hinduism and Buddhism as the physical and metaphysical center of the universe. He noted that this logo illustrates the ties between India and Tibet and hopefully also illuminates the beneficial role Tibet and the Himalayas play for all of the surrounding lands and people. His Holiness then launched Khoryug’s newest publication, Disaster Management Guidelines for Tibetan Buddhist Monasteries and Nunneries. The book provides guidelines on the five most common areas of vulnerability that Himalayan communities face: floods, storms, fires, landslides and earthquakes. In addition, the book contains a final chapter of advice written by His Holiness on building inner resilience in order to help those who have been traumatized or are emotionally distraught following a disaster. His Holiness explained how the earthquakes in Sikkim and Nepal demonstrated clearly the need for training Khoryug members in disaster management. Participants this year had numerous accomplishments to report and share with fellow members. In the afternoon of the first day, for example, Khoryug Nepal monks and nuns showcased their Community Emergency Response Team (CERT) skills with a disaster response demonstration. 30 CERT certified monastics efficiently demonstrated emergency skills such as CPR, the Heimlich Maneuver, search and rescue for earthquake victims and first aid. As survivors of the 2015 Nepal earthquake, their focused professionalism highlighted the seriousness with which they have embraced this topic. The second day of the 8th Khoryug conference was largely dedicated to discussion and feedback. In small groups, conference participants reflected together on the successes and challenges faced in their disaster management initiatives. All agreed that the format of providing training through localized workshops during 2016 was very successful in educating monastics about disaster management while at the same time calling for further workshops to advance their knowledge and skills. Participants voted to focus in the coming year on waste management, capacity building in fundraising and advanced disaster management training. On the third day, representatives spent the morning exploring the topic of waste management. Dekila Chungyalpa gave an introductory presentation, stressing that “waste” is not a definitive category but rather anything that we perceive to be no longer useful. Therefore, as Buddhists our approach should be to change that perception and find secondary use or add value to waste. Since this issue is relevant to all monasteries and nunneries, Dekila explained that Khoryug would dedicate the entire next conference to this topic. The nuns of Odsel Karma Tekchokling Nunnery in Nepal then demonstrated “upcycling” through a practical presentation. The nunnery has been extremely successful in reducing its landfill waste through recycling, composting and upcycling or transforming non-recyclable waste into handicrafts. They demonstrated for the participants various products that can be made from common packaging like milk bags, instant noodle wrappers and plastic bags. Their demonstration was complemented in the afternoon by a presentation from Lama Thinlay of Bokar Monastery in Mirik, West Bengal and Country Coordinator for India. He narrated the evolution of Bokar Monastery’s waste management over the last year from burning all of their trash to partnering with a local zero waste NGO and building a waste segregation center which now generates income from recycled goods. He stressed within 8 months that the monastery has already recouped 23% of its investment in the center and anticipates a full return in the next 3 years. 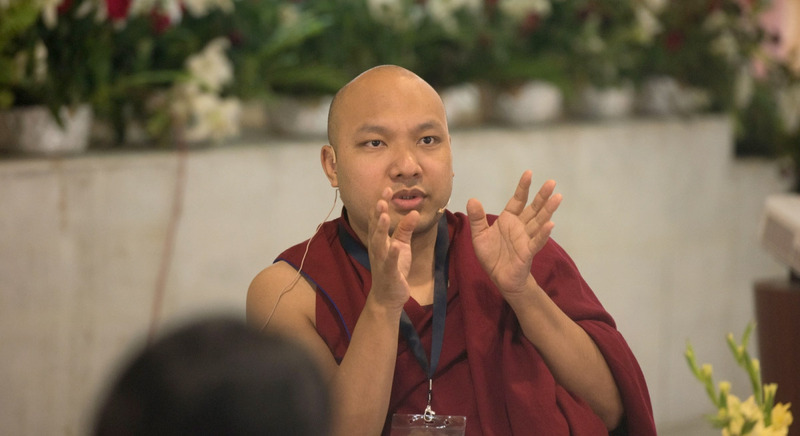 His Holiness the 17th Karmapa concluded the conference with a talk on healing the heart and mind from disaster.. He encouraged everyone to engage in contemplating impermanence as a point of practice. As impermanence is the nature of reality, His Holiness explained that a deep grounding in this practice will alleviate the shock that accompanies great change like catastrophe. He also encouraged delegates to continue disaster management training so that all monasteries and nunneries have a team of trained responders who can act in a crisis.